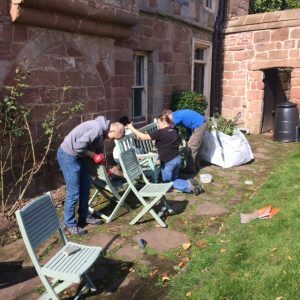 We encourage volunteers from a wide range of ages, backgrounds and skill levels; from retired people with an interest in their local community, to young people looking to gain some work experience. Our volunteers perform a number of vital roles that help us in our aims to promote and preserve historic sites in Coventry. Helping to maintain the gardens – we run a regular Thursday gardening session from 1.00 – 3.00pm, everyone welcome. Acting as guides and stewards on open days and other community events. Helping out with private functions and events. Conducting research to help our work and the delivery of events. Assisting with some of the day-to- day maintenance and cleaning of the building. Helping to develop and deliver educational activities. We are always looking for all kinds of volunteer support beyond these specific roles, and there are lots of ways to get involved. 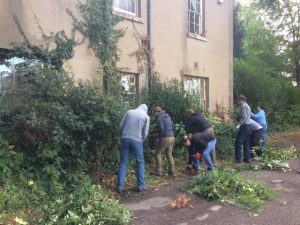 We often welcome corporate teams for voluntary “Give and Gain” days, and can tailor a day to suit teams of up to 30 There are also options for professionals to donate skilled work to our projects.